Settling down in my new home has had me go through a gamut of emotions. Like a paradox, feelings of satisfaction and disappointment, moments of ecstasy and despair all strike at once. It will be a while before I embrace this all. For the moment, I'm lapping up all the positivity that the new setting has to offer. None of our previous homes offered such a lovely view of the sunrise. We have some lovely coconut trees outlining the empty neighbouring patch of ground. Parrots, eagles, squirrels and even rare guests like the Kingfisher frolic in the precious backdrop of green amidst the concrete. I want to hug the scene and hold the gift of nature tightly to my chest even as the cynical mind tells my heart that this bountiful package of nature that gives my morning and day a new dimension will sooner or later give way for many other ambitious and concrete tall rises that will intrude into my space. Yet, for now, let me rake in the beauty, smell the sweet air and sing a song. It might not last long. What a pretty sunset & what apretty place you have created to sit & watch the sun set, beautiful Uma! Congrats! An excellent nook with enchanting view.Sit there,draw,paint or write.ideas will flow like a torrent. Congratulations!! I swear.. it is a lovely view and your new home is so beautiful.. bright, colourful and quiet.. am waiting when will u call us again :-) .. Congrats Uma..
Hey, looks like you moved to your own place! Congratulations! Lovely pics. thanks a lot, Shubha! How was your India trip? Are you back home? Hey... Congrats on moving to your new nest. May you have a million more sweet memories !!!! So pretty! Yeah we cannot control the concrete jungle outside. Soak in the beauty when you can and hold on the beauty inside your nest, that's in your control. Very well written Uma.. Loved the expression! Such a wonderful view!!! I can completely identify with your emotions. I practically live in the balcony at home. 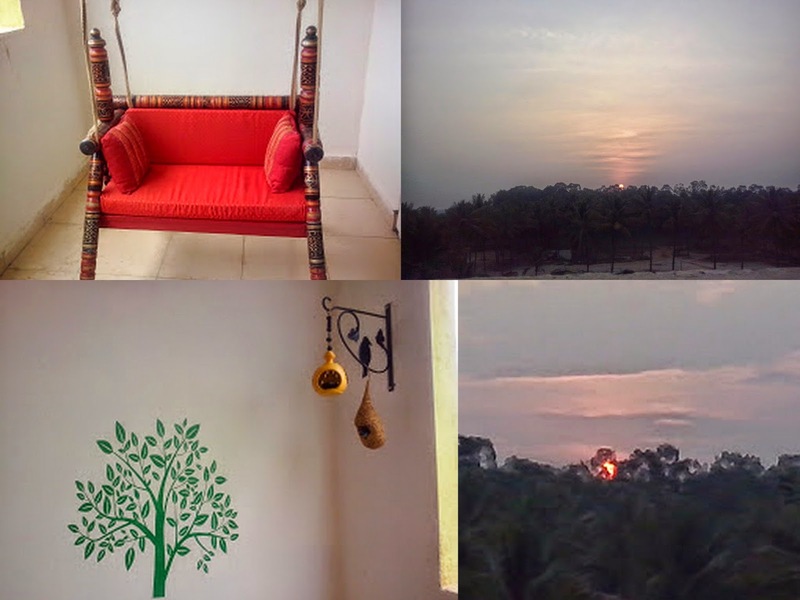 It has a lovey view of a thicket of trees and the sunset. That's lovely Aarthy..Hope that the view is never marred by human development. Such a beautiful view, I am sure it will inspire many great posts!! The poem is as beautiful as the view. It Iooks lovely, indeed, Uma! Many blessings to you and your family in your new home! Congratulations on the new house and Alles Gute! !